Now we will learn how to find the H.C.F. of polynomials by division method. We already learnt how to find out the H.C.F. by factorization of those polynomials which can easily be factorized by the method of factorization of second degree and third degree expressions. But now we will learn that if the number of terms in the given expression is 4 or more than 4 and the power of the variables is 3 or more than 3 and they cannot be easily factorized by the known methods of factorization, then to determine the H.C.F. of those expressions, we need to use the long division method. 1. Find the H.C.F. 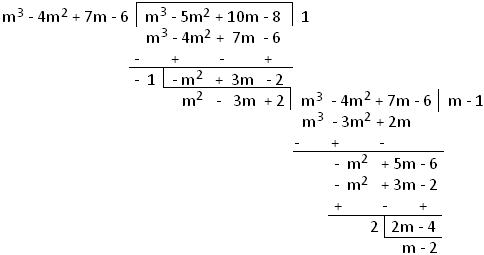 of 3m3 – 12m2 + 21m – 18 and 6m3 – 30m2 + 60m – 48 by using the division method. (i) The given two expressions are arranged in the descending order of powers of the variable ‘m’. Therefore, the common factors of the two expressions are 3 and 6. The H.C.F. of 3 and 6 is 3. In the last step 3 is multiplied with the divisor obtained by division method. 2. Determine the H.C.F. 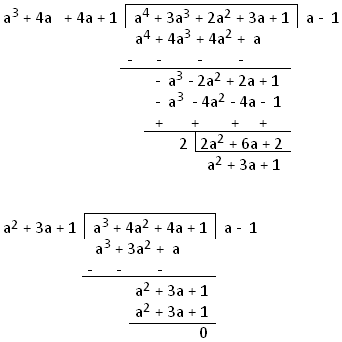 of a4 + 3a3 + 2a2 + 3a + 1, a3 + 4a2 + 4a + 1 and a3 + 5a2 + 7a + 2 by using the division method. (i) The given three expressions are arranged in the descending order of powers of the variable ‘a’. (ii) We see that there are no common factors between the terms of the given three expressions. So, we observe that a2 + 3a + 1 is the H.C.F. of the first two expressions. Now let us see whether a2 + 3a + 1 is a factor of third expression or not. 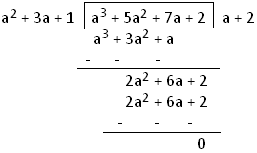 Again, we observe that third expression ‘a3 + 5a2 + 7a + 2’ is exactly divisible by a2 + 3a + 1. Therefore, the H.C.F. of a4 + 3a3 + 2a2 + 3a + 1, a3 + 4a2 + 4a + 1 and a3 + 5a2 + 7a + 2 = a2 + 3a + 1.